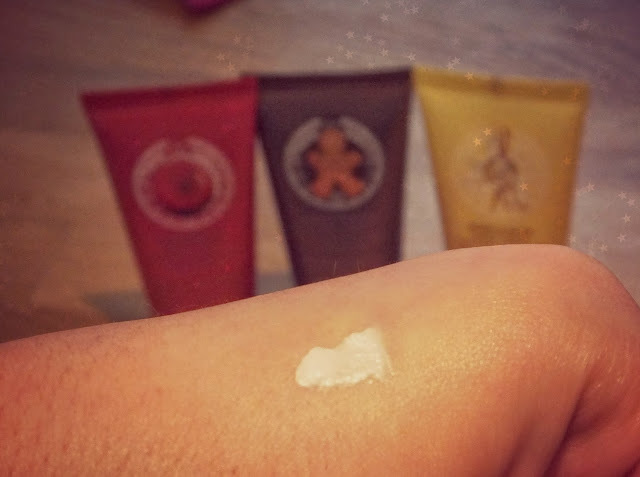 CHRISTMAS: The Body Shop Festive Hand Cream Trio + DISCOUNT CODE! The Body Shop has been a staple store on our high street for a very long time, I always remember going in to get those bath pearls that would melt in the bath releasing bubble bath! One thing The Body Shop always get bang on is their scented products, they are never scents that you can barely detect, they're full bodied, long lasting and often appetising scents! Their Chocomania range smells ridiculously good - think chocolate, sweet and cocoa butter - heaven! I've also heard amazing things about their Honeymania range but I'm yet to try it out. The Body Shop always bring out a lovely range of products especially for the festive season, this year the main three ranges are Ginger Sparkle, Vanilla Bliss and Cranberry Joy. When it comes to scents of skincare, body care, candles, air fresheners - anything really - vanilla has to be one of my favourites! It's the one scent that is consistently lovely and had become quite a homely scent to me now. As for Christmas scents Cranberry is up their with my favourites, not helped by the fact that I'm slightly addicted to dried cranberries at the moment after making golden honey granola (see post here)! So I was excited to try The Body Shop's Festive Hand Cream Trio* (£12), which includes all of their Christmas scents this year. I applied each of these of three days and I couldn't believe how long lasting the scent was! The hand cream was very moisturising, which is perfect for this cold weather. My hands always seem to suffer from being in the cold, then hot, then cold etc. Each of these hand creams are a perfect size for popping in your handbag or if your feeling generous they would make a lovely Christmas present. They come in a Christmassy gift box too, which always makes wrapping easier! At the moment their is a voucher code for The Body Shop that will get you 40% off your shopping PLUS free delivery! The code is 14322. If you enter this at the checkout the amount will be deducted. The Festive Hand Cream Trio is £12, but with the discount and delivery code it will only cost £7.20! This offer finishes on Monday 25th November 2013, so don't miss out! Which is your favourite Christmas scent?